MQTT sensor project for CoffeeBin. It uses deep sleep ,ode to save energy. It messures the volatage on bootup an send the result as MQTT message to the broker. It has an switch to broadcast an MQTT message, that the coffe machine is in maintenance mode. 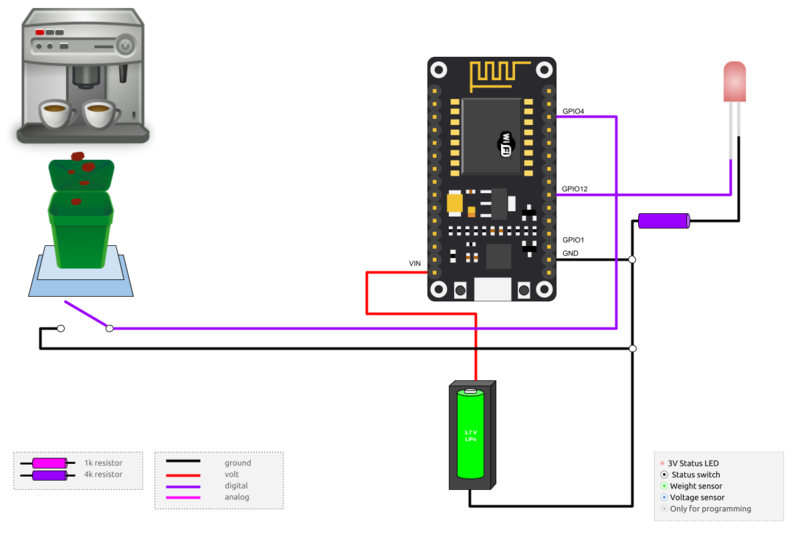 Install the USB driver for your ESP8266 and find out on which port your device is avaible. For convinience you can save that information in your ~/.bashrc or ~/.bash_profile file. If you don’t wanna do that, you have to add the port to each command. You need to install Docker to build it locally. mos flash --esp-erase-chip --esp-baud-rate 115200 --esp-flash-params "dio,4m,40m"
© Copyright 2018 Revision 96ab94df.